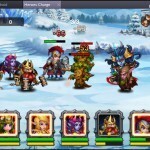 Heroes Charge is an addictive and massive RPG game to fight in a trio of battles to collect majestic items needed to train and grow your army of heroes. There is both solitaire bouts and online conquest in the Arena in person vs person battles. Will you build the ultimate clan of heroes to conquer all? 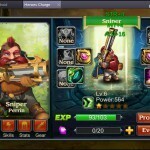 Discover more in this review of Heroes Charge! *Play solitaire or online against others! Many conquests to battle in! Join and/or create guilds as leaderboard ranking grows! There are a lot of granular aspects to the game not that are entirely explained/clear. 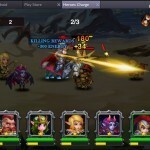 Heroes Charge is massively popular and addictive role play game with plenty of missions to accomplish. Initially you must learn how to fight in a guided tour- feuding solitaire in the “Campaign” levels. 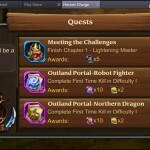 Other areas such as the “Enchanting”, “Merchant” or even PVP in the “Arena” do not become available until your team advanced past certain levels. * The only way to rapidly do this is fight and be victorious in the Campaign levels. We’ve accompanied this review with a great beginner’s guide with tips & tricks for Heroes Charge. For example, one tip is to advance to unlock the “Elite” campaign- which is basically re-starting the “Normal” campaign levels yet only fighting boss rounds versus each individual round. Of course Elite levels are more difficult but they shell out some of the most vital chest items needed to upgrade your hero’s skills. 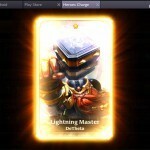 As you play you can find and unlock various heroes with an array of abilities. There are more than 50 unique heroes to collect, train and upgrade. Though you can only choose up to five to take into battle. If you have more than five, you have the choice to interchange to either; give a hero more experience or offset their abilities against enemies you’re combating. For example, you may be fighting a tough character that often is immune to physical attacks and swapping a mage in the lineup offsets and causes damage with majestic strikes. When your heroes take a hit their rage builds to allow them to unleash a powerful strike enemies (you’ll see the avatar fire up). One strategy I learned for defeating tough rounds is to try to save the power strike of all heroes until the last round where foes are more powerful. The order of heroes chosen as well as the timing of the strike is often crucial to prevail. Bouts in the Campaign are in rounds of three. You have a finite time to rid all foes in the levels. At the end you can collect all items dropped by minions. 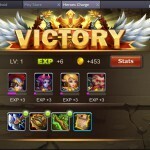 These items are vital for equipping and upgrading your heroes. The upgrade interface is the only area I have quibbles with because it leans more towards real monetary in-app purchases in order to advance abilities faster. Otherwise it will take a lot longer to organically build your army. Though there are incentives to play in the game daily; including Arena battles with others simulated online (which you can compete in every ten minutes), daily free items, coins & gems, plus alternate days for combating in “Advanced Instances”. 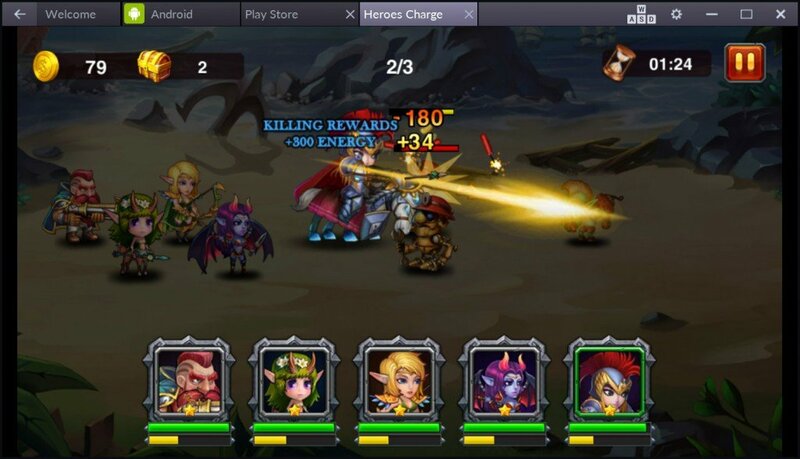 Heroes Charge game can be played on mobile platforms such as Android and iOS but can also be played on PC and Mac with BlueStacks App Player. 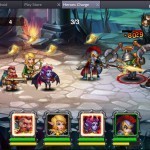 Heroes Charge is an engaging game that will keep you coming back multiple times per day. As levels advance conquering enemies become increasingly challenging- which resorts to empowering your team with items collected. You can lead the charge in solo play or in simulated bouts with others online. Play on your smartphone, tablet and even laptop or computer. 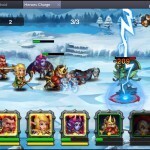 Download and play Heroes Charge now!